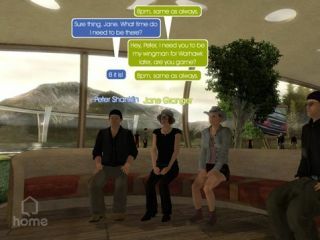 Sony has unwrapped a new interactive online virtual world designed for PlayStation 3 owners. Called simply 'Home', it's a similar concept to the hit Second Life user community on the PC. Home is a real-time, online, 3D networked community available on the PlayStation Network. It enables PS3 users to interact, communicate, join online games, shop, share private content, and even build and show off their own personal spaces to others in real time. The community was officially announced during a keynote by Phil Harrison, president of Sony Worldwide Studios at the Game Developers Conference in San Francisco. The virtual world enables you to create your own avatar and to move around the 3D virtual world, interacting with the environment and with other PlayStation 3 Home members. And for any UK buyers concerned about being out of pocket after they've paid £425 for their console later this month, the good news is that it will be available as a free download from Sony. As soon as you've registered your avatar, you'll be given a virtual home to live in, which can be personalised in many different ways. Zumi Kawanishi, chief technology officer of software at Sony, said: "This is a significant step forward in the area of user community services and emergent entertainment experiences. "While the 3D graphics demonstrate the power of PlayStation 3 and the PlayStation Network, the most impressive feature in Home is the variety of ways in which multiple consumers, as well as our third-party partners, can experience the next generation of communication by interacting and sharing among each other. "I feel strongly that this unique blend of community, user-generated content, collaboration and commerce will expand the future of computer entertainment." Home is currently going through a stringent in-house testing phase, and is expected to launch in the autumn as a 500MB download.